This is fascinating and tempting. I love a good DIY build, but I just don't trust my existing hardware (PS, fans, drive bays, etc). They're all pushing 7 years old and have had a hard life including mutiple house-moves. I'm shopping for a new tower with Windows 7 pre-installed. This time around I'd prefer minimal modding (i.e. I'd be happy to upgrade the graphics card after the fact to achieve 3-monitor support, but I don't have time to mess with a full build right now). I want solid internals & build-quality out of the box. Seems like in this economy there ought to be some deals out there on this kind of hardware. Thanks in advance CXC... this has been a timely thread for me. I'm with John here, unfortunatly my old tower is 6+ years old and had been upgraded in the past but it's basically to the point where I need to start over from scratch. I can just see putting together an awesome machine only to realize I don't have enough cooling or some other component suddenly becomes the weak link. if I break the budget that would pretty much on par with the rest of my car projects $1k would still be a nice target even if it means I need to expand down the road. If you wanted to buy ready made, I would recommend THIS and add the Single AMD Radeon HD 6870. It's still not as quick as the configuration above, but it's hard to get a config just right with OEMs. ^^ What CXC posts above is pretty much a newer version of what I built myself in the spring. Warning, there was a lot of swearing, and my thread is in OT. Thanks CXC - I will look into that config and decide if I am up for the build. Looking at your OEM alternative, I find it hard to get excited about the Dell XPS but if I'm being honest that's probably all I technically need. What's you opinion on the current crop of gamer boutique OEMs out there: Alienware, Maingear, V3, Cyberpower, Origin, Digital Storm, etc? Any stand out as particularly good/bad in the <$2k (tower-only) range? BTW: sorry everyone for hijacking this thread into geek-land! Boutiques will be better for expandabilitiy (as they use standard components) and raw speed, but you pay for that increase in performance. If the budget is there for it, they are good investments though. I'm partial to Maingear and DigitalStorm at the moment. When looking at configurations, note that iRacing is partial to CPU and graphics power. It really can't take advantage of more than 6GB of system memory and I will always recommend graphics cards with as much VRAM as possible. If you plan on going multimonitor now or later, AMD video cards are the best bet for now. Thank you again. Definitely thinking of going multi-monitor (x3) within 6 months. Hi All, I am also looking to get into I racing, I have been searching for rigs, I am a little overwhelmed. I guess my budget is around $1500 just for the rig. I definitely want something sturdy and I am not too concerned about the footprint. I am over six foot and I like to think 220 pounds but do not want to check... So I want something comfortable. I do not know the benefits of 3 screens. I just don't want to be fixing or adjusting, kind of want a turn key. Hi Mike. Turn-key is just impossible at that budget. You'd really be in our price range for a full, turn-key system. There are cheaper seat setups (I have one) and while they're no doubt less enjoyable and precise, it'll work. If you have a big, modern, hi-def TV, you can set it up as your monitor. Please be aware of "significant other" ramifications, as such (my living room in arlington has looked this way for about 6 months). My setup is pretty budget and does pretty well for me. My wife works for Chase and gets a Dell discount, I think the OEM dell setup that CXC suggested with the upgraded graphics card is like $1100 with our discount. So I'll have ~$1900 in mine all together. Not quite your $1500 target but maybe you are even a more saavy shopper than me. Try craigslist for the simple stuff like the TV / Monitor and it will help the budget. I'd love to go all out but you have to pick and choose your battles. 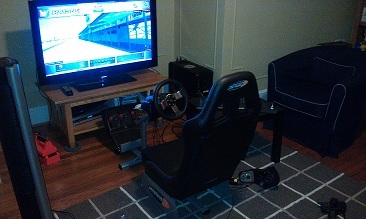 I'd much rather buy more tires and track time for the GT3 than a really expensive setup for my winter gaming. Thanks for all the responses, the $1500.00 budget is just for the seat and frame. I was thinking another $1,500-$2,000 for computer and larger Tv, might go pawn shopping for tv. I already have a Logitech g25 wheel, but it looks like I will have to upgrade. Am I being realistic with this budget?? I guess my goal is not to fell like I am handicapped by the equipment. My background is only going through Grand Turismo 2,3,and 4 and on the track I have been running De's about 9 years. Thanks for all the help, just seems like all the rigs out there claim to be the best. For a little less money, you can always go the Obutto Route. A good pedal set is more important than anything else. My recommendation would be a load sensing set like the Fanetec Club Sport Elite set. Brake pedal feel is important. The G25 works as a good starter though. The biggest thing will be practice, practice, practice (just like in real life). Don't worry about speed at first. Consistency is the key. Sorry to be late to the discussion. Feel free to ask me any iRacing specific questions, I work for the the company.